Thinking of creating even more havoc in your already contentious divorce in Delaware County? Then focusing on your own emotional destruction and playing games are sure to do the trick. 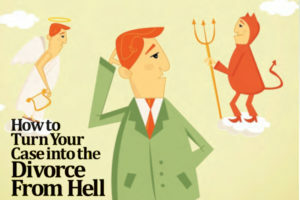 Published by the American Bar Association, “Turn Your Case into the Divorce from Hell” is a worthwhile tongue-in-cheek read if you are in the process of a divorce and actually do want to focus on how to accomplish what you want to achieve in your divorce negotiations. The family law attorneys at Raffaele Puppio in Media, Delaware County, are well-versed in managing difficult divorces. If this is an issue you are facing, we are available to help. Family Advocate, Vol. 34, No. 1, (Summer 2011) p. 22-24. © 2011 by the American Bar Association. Reproduced with permission. All rights reserved.